Edna Louise "Myers" Brawley, age 81, of Marble Hill, MO, died Tuesday, July 26, 2011 at her residence in Marble Hill. She was born February 10, 1930 at Lutesville, MO; daughter of Charles Marvin and Lula Brown Myers. 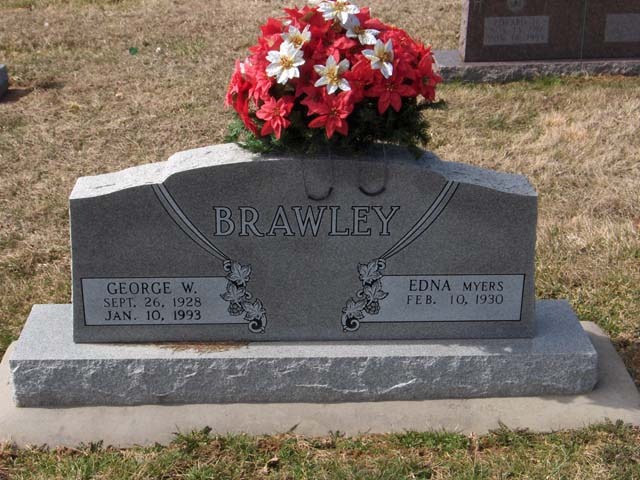 She and George W. Brawley were united in marriage on February 18, 1956. Edna was a factory worker for Killark Electric and a member of the IBEW Local #1. She also attended the Cane Creek General Baptist Church near Marble Hill, MO. Survivors include: two daughters, Georgia Harding of Fort Worth Texas, Genia Lynne Freeman of O'Fallon, MO; four brothers, five grandchildren and three great grandchildren. She was preceded in death by her husband, parents, five brothers and two sisters. Visitation will be Friday, July 29, 2011, from 6:00 to 8:00 PM at the Liley Funeral Home in Marble Hill. Graveside Services will be Saturday, July 30, 2011 at 10:00 am at the Bollinger County Memorial Park Cemetery Pavilion with the Rev. Raymond Armstrong officiating. Burial will follow in the Bollinger County Memorial Park Cemetery near Marble Hill.